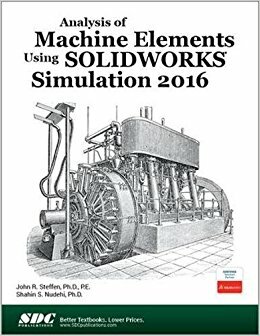 Analysis of Machine Elements Using SOLIDWORKS Simulation 2016 is written primarily for first-time SOLIDWORKS Simulation 2016 users who wish to understand finite element analysis capabilities applicable to stress analysis of mechanical elements. The focus of examples is on problems commonly found in an introductory, undergraduate, Design of Machine Elements or similarly named courses. In order to be compatible with most machine design textbooks, this text begins with problems that can be solved with a basic understanding of mechanics of materials. Problem types quickly migrate to include states of stress found in more specialized situations common to a design of mechanical elements course. Paralleling this progression of problem types, each chapter introduces new software concepts and capabilities. Many examples are accompanied by problem solutions based on use of classical equations for stress determination. Unlike many step-by-step user guides that only list a succession of steps, which if followed correctly lead to successful solution of a problem, this text attempts to provide insight into why each step is performed. This approach amplifies two fundamental tents of this text. The first is that a better understanding of course topics related to stress determination is realized when classical methods and finite element solutions are considered together. The second tenet is that finite element solutions should always be verified by checking, whether by classical stress equations or experimentation. Each chapter begins with a list of learning objectives related to specific capabilities of the SOLIDWORKS Simulation program introduced in that chapter. Most software capabilities are repeated in subsequent examples so that users gain familiarity with their purpose and are capable of using them in future problems. All end-of-chapter problems are accompanied by evaluation check sheets to facilitate grading assignments.